If the recent examples of display related patents are anything to go by, the future seems pretty bleak for regular planar displays (or flat-screen displays, in layman’s terms) found in smartphones and tablets. 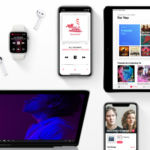 Earlier today, Apple has been granted an interesting patent based around a unique display design that can be applied to mobile devices ranging from smartphones and tablets to even e-book readers and media players among others. 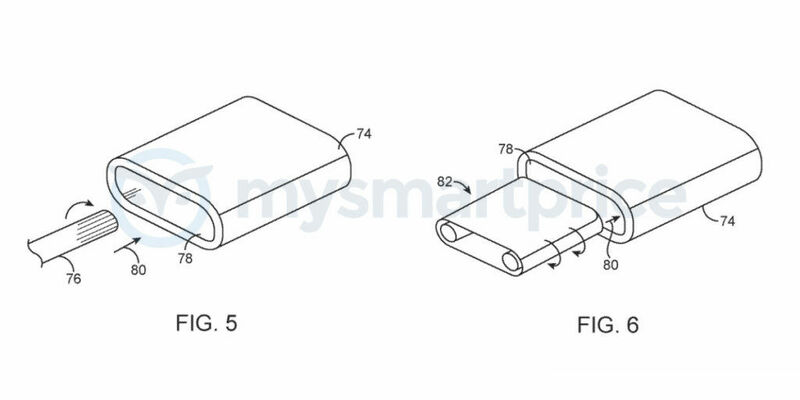 Described as a continuously wrapped display, Apple’s patent envisions mobile devices with a flexible display wrapped around the entire device to form a continuous screen. While traditional mobile devices have to contend with a single display on the front face, some ingenious implementations such as the Vivo NEX 2 incorporate a secondary display at the rear. 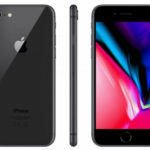 Apple’s patent, however, not only describes a mobile device bearing a single display that is wrapped around to form a continuous screen, but it also lays down associated usage scenarios as well as hardware implementations designed to leverage its infinitely scrolling nature. The practical implementation of this patented design comprises of a hollow outer structure meant to serve as a protective cover for the flexible display panel. 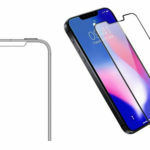 Apple provides a number of material options for the transparent protective cover, including a simple polymer film, traditional clear glass, transparent plastic, and clear ceramic. The document, however, places great emphasis on lab synthesised sapphire and goes into much detail about the manufacturing process therein. Based on the precious little information found in the patent document, we believe that Apple will most likely employ the Czochralski process that is notably used to manufacture silicon wafer used in processor and GPU dies, but it can also be extended to artificially manufacture synthetic gemstones like sapphire. Click here to read how the fascinating sapphire crystal manufacturing process could be implemented by Apple. A flexible display is glued to the inside of this hollow sapphire cover using transparent adhesives in a number of configurations – some of which achieve a seamless design, whereas others exhibit a conspicuous seam where the ends of the flexible display meet. Since this isn’t exactly a foldable display, but instead a cylindrical one employing a flexible wraparound screen, the PCB doesn’t necessarily have to be flexible as well. The patent document, as such, also specifies a fibreglass-filled epoxy material such as FR-4 to form the rigid PCB substrate, which is also the same substrate used in traditional inflexible PCBs. 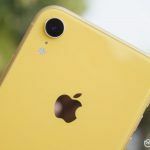 Nevertheless, Apple also keeps the PCB specifications open to incorporate dielectric materials such as ceramic and plastic, while also keeping an option open to include flexible polyimide PCB sheets, as seen in a Google patent we had published last week. The latter is a strange choice on Apple’s part considering how this mobile device isn’t exactly foldable and will therefore not require the PCB to bend as such, so there’s no real need for a flexible PCB. However, there seems to be a method to this madness. 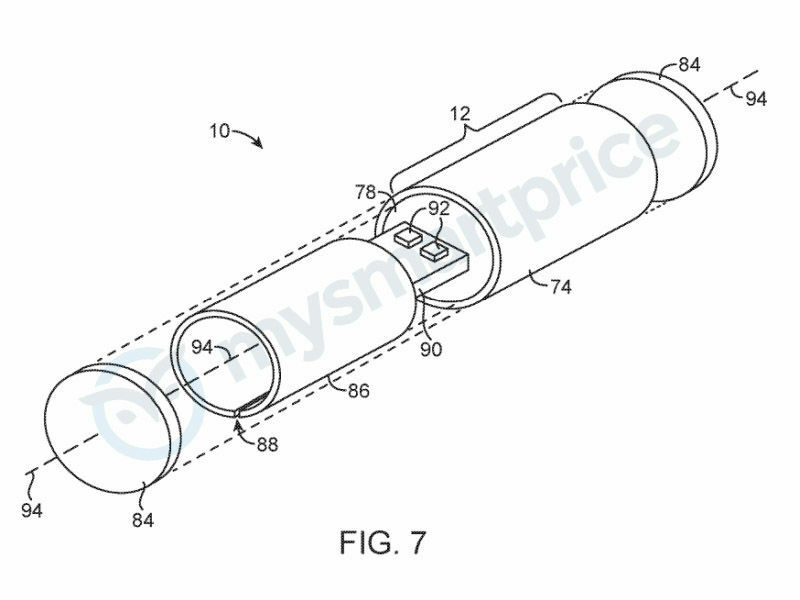 Digging into the patent document further reveals that Apple might not restrict the form factor of this device to the cylindrical shape. Other designs include a triangular cross section that provides three distinct display surfaces of equal dimensions, and yet another one with rectangular cross section bearing two broad and another two narrow display surfaces. 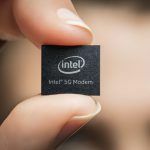 A third implementation has the closest resemblance to the traditional smartphone, with the same single continuous display forming the two faces of the device, with the other two sharply rounded edges also capable of displaying content. A flexible PCB would then prove ideal to accommodate the sharper corners evident in the other designs. All design and construction details aside, Apple’s decision to opt for a fixed implementation of a flexible display seems strange considering how everyone in the industry is running after implementing the same display technology to make convertible foldable devices. The company, however, has specific use cases for this design. 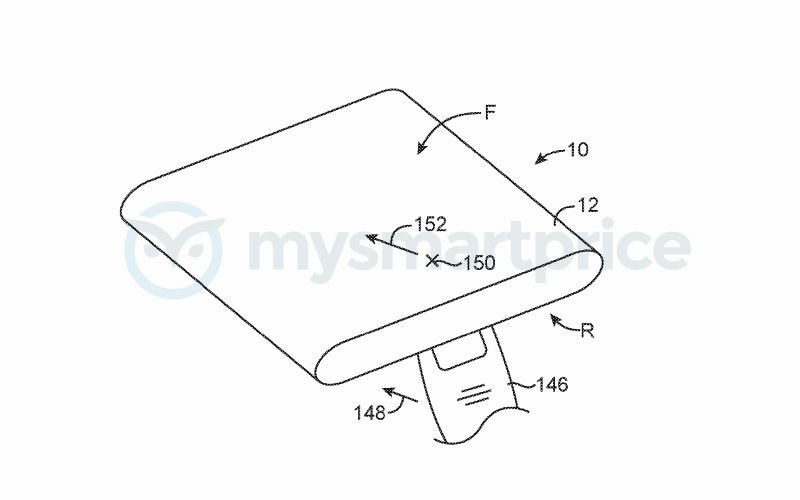 The basic idea underpinning this patent seems to go beyond traditional touch-based input methods and incorporate intuitive motion sensing capability to leverage the unique shapes of the patented device. 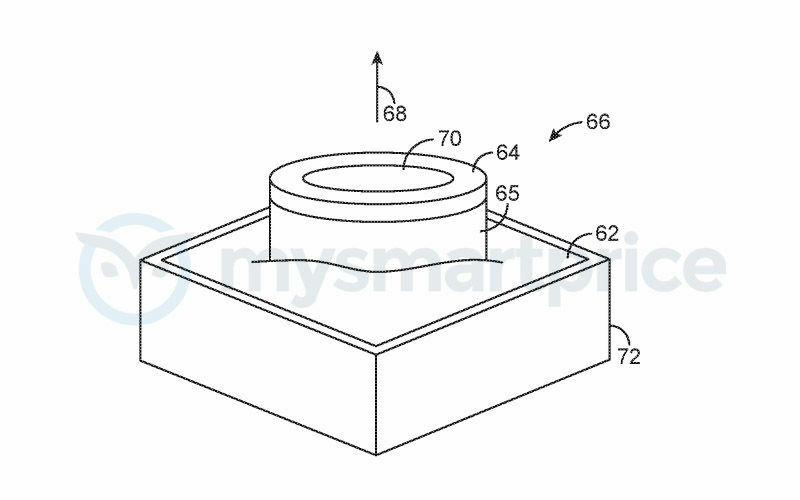 The patent specifies implementation of sensors such as gyroscope and accelerometer in conjunction with other unspecified sensors to gauge the exact orientation of the device, in addition to the capability to detect tilt, roll, pitch, yaw, and other movements. This will come in handy in the triangular and rectangular implementations, wherein the user can merely tilt the device up/down or left/right to scroll vertically or horizontally between documents and webpages. What separates Apple’s motion control implementation apart from others is the degree of control. 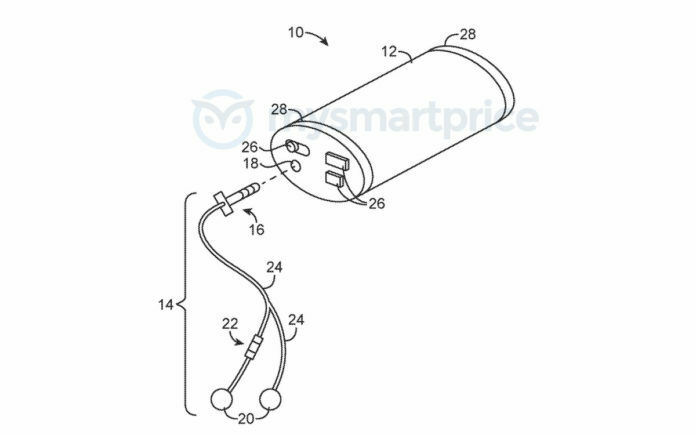 The patent makes it clear that the motion input detection will be granular, which means that you can tilt the device slightly upwards to, say, gradually scroll a webpage, whereas tilting the device at a steeper angle will speed up the rate of scrolling. Gyroscopes and accelerometers (along with unspecified sensors such as cameras) can additionally be used to determine which of the three (triangular design) or four (rectangular design) display faces of the device are directly in the user’s line of vision. Instead of forcing the user to interact with the touchscreen, these sensor arrays could do anything ranging from flipping pages and rolling text to even choosing what to display on one of the multi-faceted displays depending on whether or not the user is looking at them. This manner of motion detection can also be used to good effect in the original cylindrical implementation by allowing the user to scroll between the displayed content horizontally or vertically by merely the rotating the entire device along the X and Y axes. 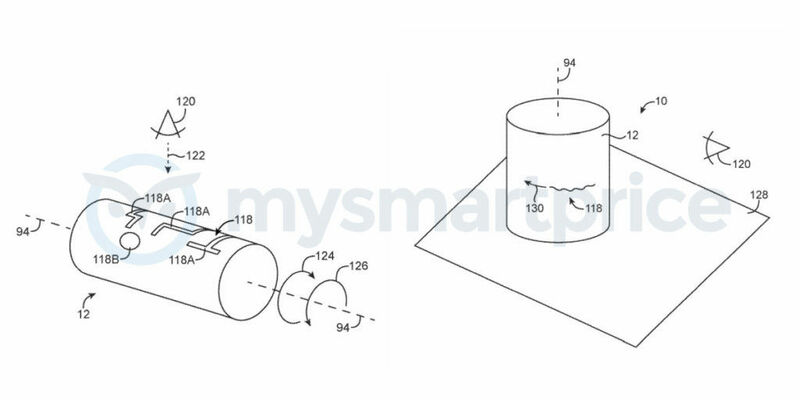 Furthermore, having the display wrapped around cylindrical, triangular, and rectangular shapes allows the rear side of the display to be used as a touchscreen for gestures and other input implementations that Apple could come up with in the future. What’s more, such a display configuration can make for a next generation iPod that displays infinitely scrolling lyrics synchronised to keep up with the pace of the song being played. 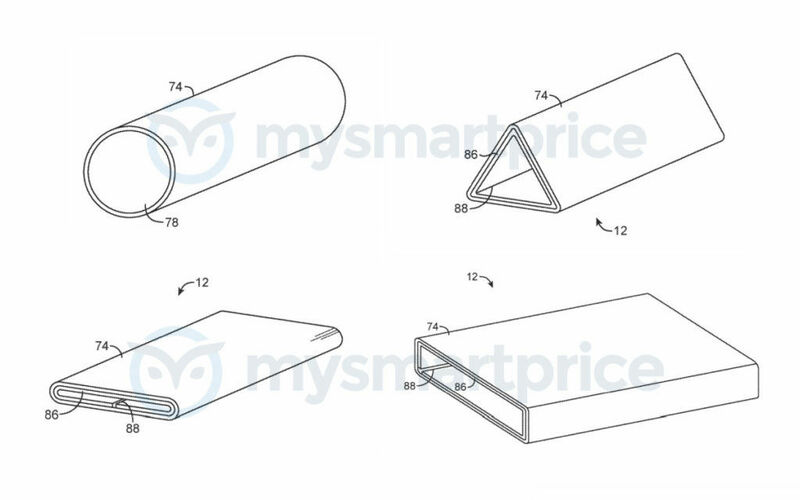 The patent document also goes into details of how app developers could leverage the infinitely scrolling cylindrical design of the device for interesting side-scrolling games as well, and how the multiple display faces of the triangular and rectangular implementations could be used for convenient multi-tasking. iPhone, iPad, iPod, or a New E-book Reader? Digging deeper into the patent document reveals some interesting choices for the display panels. Apart from the usual suspect – that is foldable OLED panels – Apple has strangely also incorporated e-ink displays. This includes electrophoretic displays, which form the basis of virtually all e-book readers, such as Amazon’s Kindle. These displays are thin, lightweight, extremely power-efficient, and can be potentially used in flexible devices. The only chink in the armour of this display technology is the atrociously slow response time and memory effect – both making them only suitable for static content such as e-books. 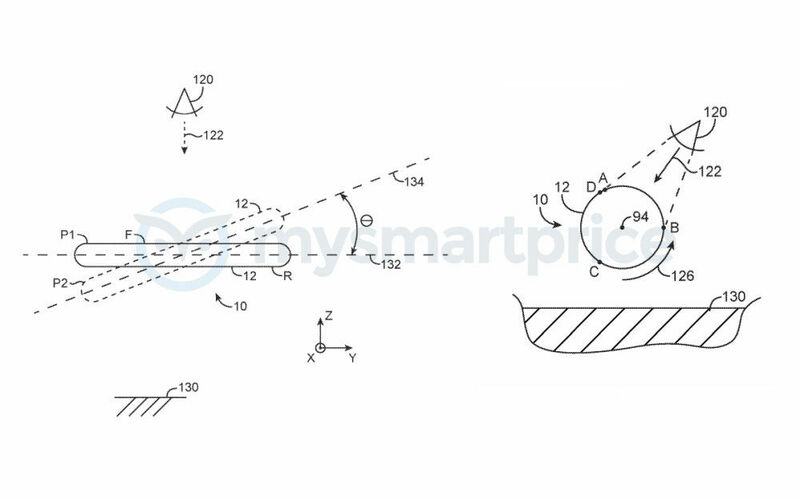 However, the Apple patent also mentions electrowetting displays as a possible choice for the flexible display. Unlike the slower state changing titanium dioxide particles used in regular electrophoretic displays, electrowetting displays employ a mixture of coloured oils and water. You might want to refer to this comprehensive article on the technology, or check out the video below to get a better idea. The short version, however, is that electrowetting displays enable rich colour, faster pixel response time, as well as high brightness and contrast. All of this is achieved while retaining the power efficiency, thinness, and excellent sunlight legibility of e-ink displays, while also enabling full-colour video playback. 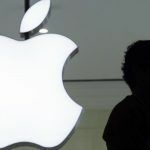 It is quite interesting to see Apple put genuine effort into this fundamentally game-changing innovation, as opposed to its present tendency to incorporate incremental changes long after they have been popularised by the competition. When everyone else is making a beeline for foldable displays, this particular Apple patent exhibits a rather out-of-the-box implementation of flexible display technology. The possibility of implementing hitherto untapped technologies (in mass production, that is) such as electrowetting e-ink displays for power-efficient and thinner flexible displays would prove to be a stroke of genius if Apple manages to transform it into a real product. The infinitely scrolling display – when combined with motion control and unique cylindrical, triangular, and continuously wrapped display designs – can make for anything from an interesting all-display version of the iPhone and iPod to even what could be Apple’s potentially ground-breaking foray into e-book readers with the cutting-edge electrowetting display technology.